What Birds Did You See Last Weekend? Where Did Those BUGS Come From? This is always the kick-off for the gardening season for me. 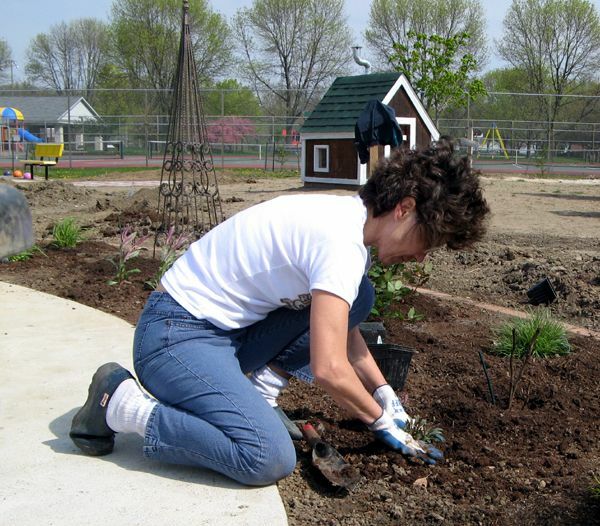 When the Fort Wayne Home and Garden Show starts, it means spring is just around the corner. 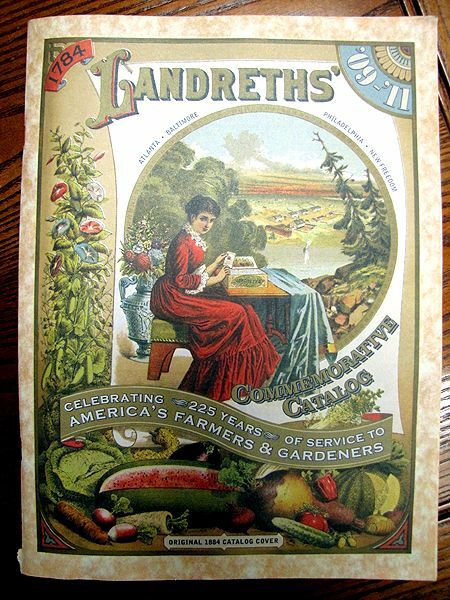 Other garden shows pop up, I finalize my seed orders and I begin to make random stops at garden centers, "just to look." Mom and I visited the show last Friday, taking in the sights, sounds, and the wonderful spring smells. There are a few vendors that we look forward to every year and each of them was there. 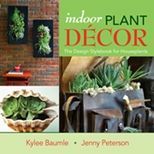 I've been hot on succulents ever since I read Debra Baldwin's Succulent Container Gardens. 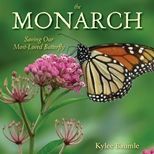 I'd grown them before that, but her inspiring book motivated me to delve into them further. Young's Greenhouse always has a nice selection of succulents at this show and they didn't disappoint me this year either. Somehow, I managed to resist these, but when I got to one of my other favorite vendors, Country View Greenhouse, my will power gave way. I purchased two Aloes, both of them in bloom. 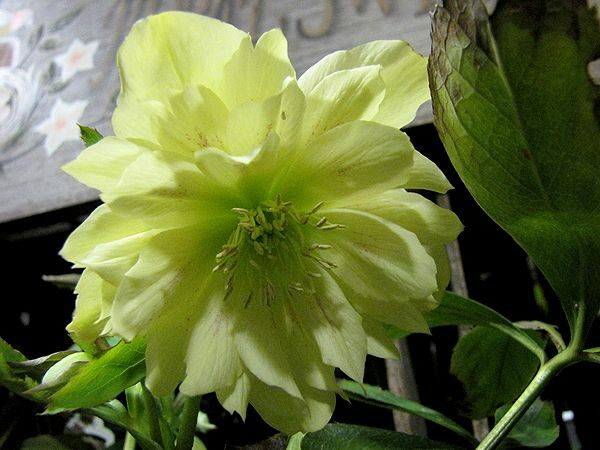 I purchased a 'Red Lady' Hellebore from them last year, and almost bought this yellow 'Ballerina Series' double they had this year. 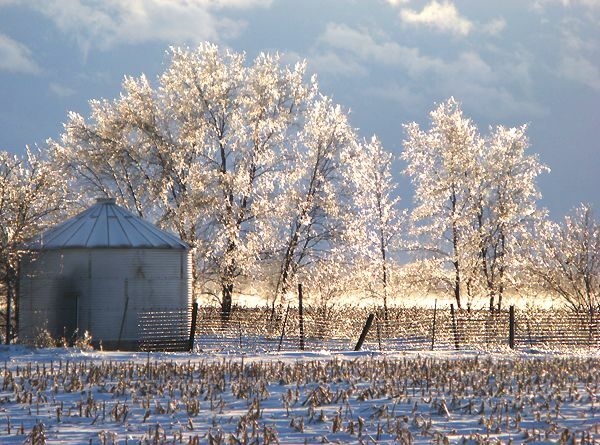 I like Country View, because they always have something a little out of the ordinary. This year, a couple of things caught my eye. A six-foot Arizona Cypress (Cupressus glabra 'Blue Ice') was quite attractive with its glaucous leaves/needles. I've seen varying hardiness ratings on this, with it being one of those marginal plantings for our zone 5, I think. 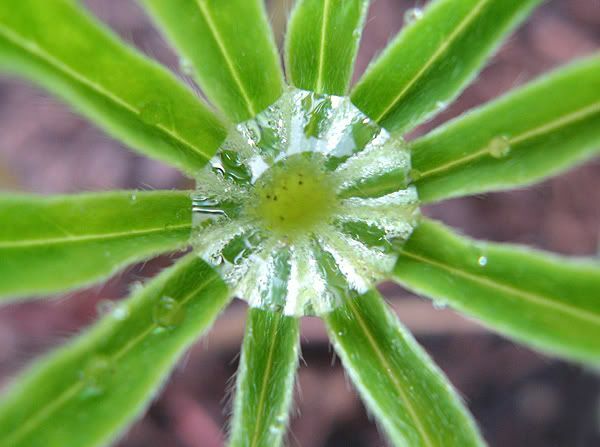 It grows in a conical shape and has round cones. 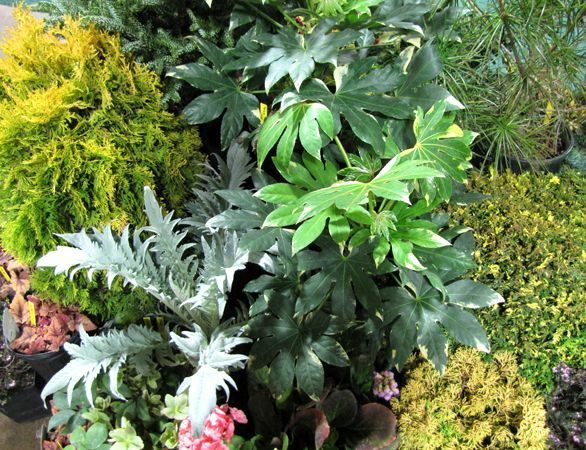 Country View always has plants with great texture and color to their foliage, as shown here with the Cardoon (Cynara cardunculus), Fatsia japonica, and Dwarf Hinoki Cypress (Chamaecyparis obtusa). 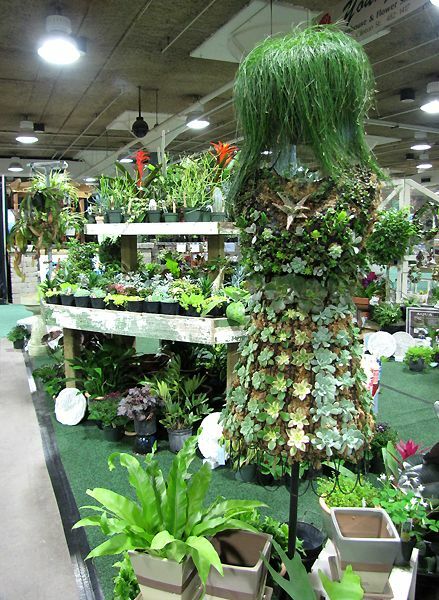 But even better than that was the wire dress form that they'd stuffed with moss and potting medium, then planted with succulents. Adding Fiber Optic grass (Isolepis cernua) for hair made for an eye-catching display. 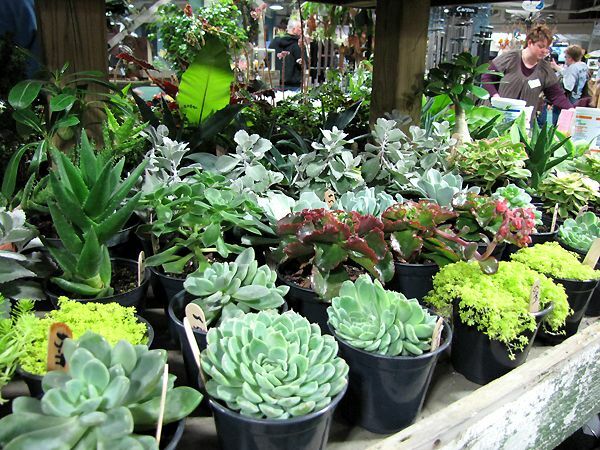 We then moved on to one of my very favorite places to purchase plants, whether they are here at the show or back at their home base at the Foellinger-Freimann Botanical Conservatory. Everything they offer for sale is healthy and so reasonably priced. I chose a container which was planted with several different succulents. 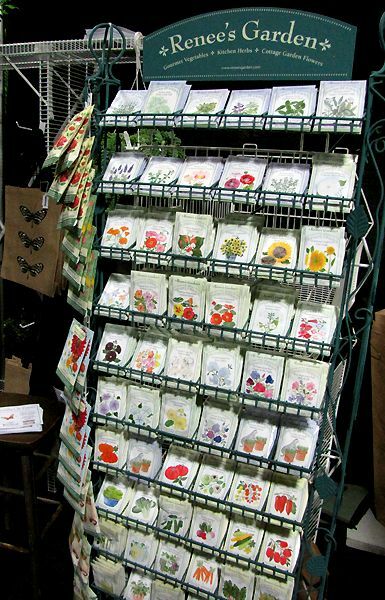 The Conservatory sells an assortment of some of my favorite seeds - Renee's Garden Seeds. I'll be growing several varieties in my garden this year, courtesy of Renee's (thank you! ), including the 'Spitfire' Climbing Nasturtium that 50 garden bloggers (including me) will be growing at the same time for the seed GROW project. 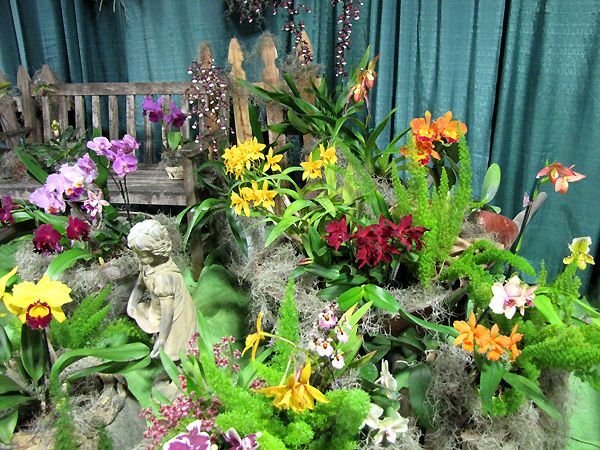 Just down the aisle from the Conservatory's booth was another favorite stop, that of the Three Rivers Orchid Society. They always have such luscious orchids on display and some very nice ones offered for sale. Though I didn't purchase an orchid as I'd thought on the way to the show that I might, I had a nice chat with one of their members about how to get orchids to rebloom. The information she gave me was consistent with other advice I'd received previously. Across from that display , The Northern Indiana Florists' Association was giving away baby Spider plants. I was glad to see quite a few young people requesting them. 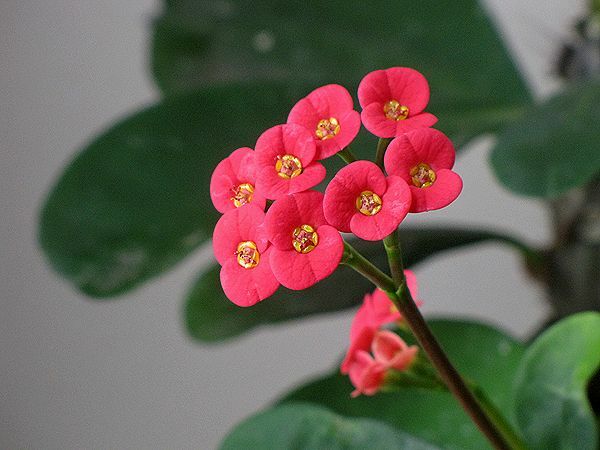 This was one of the first house plants I ever grew, when I was in college, so I picked one up for old times' sake. Woodland Water Gardens always has a nice display. See the golden conifer lighting up the left side of the photo? You can buy it for $1000. 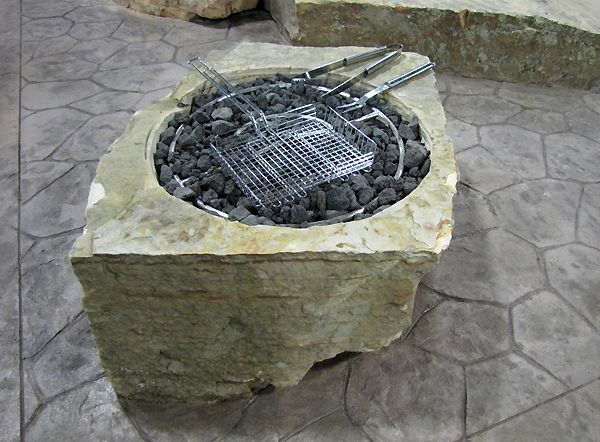 I liked the barbecue grill they had put into an outcropping. We walked over into the home area of the show, which had vendors of all sorts, including my brother-in-law's Return-to-Center mailboxes. They were featured on the evening news and our niece, Melissa, did a great job of explaining them. We sampled food items, chatted with friends we ran into, and before we left the show, I got to meet Becky Williamson, Associate Show Producer of Ft. Wayne Shows, Inc. Becky was the one responsible for sending the free tickets I gave away last weekend. 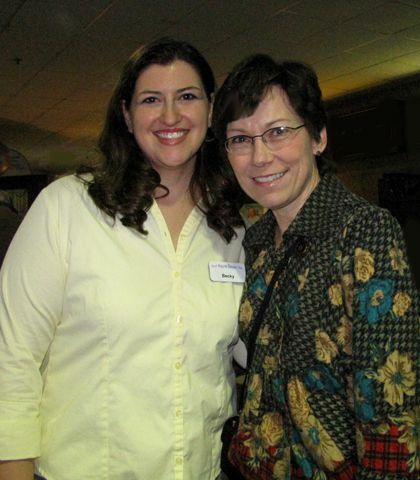 Thanks again, Becky, and it was great to finally meet you! Mom and I finally gathered our purchases and headed home. Not a moment too soon either, because by the time we got to my house, the roads were drifting and icy. Because they weren't going to get any better by morning, we canceled our trip to Columbus for the Central Ohio Home and Garden Show. We'll be in Chicago this weekend for the Chicago Flower and Garden Show, where we'll meet up with some blogging friends that we met for the first time last year and some that we'll be meeting for the first time. Social media is confusing to some. "What's Twitter all about?" I've been asked, and I find myself struggling to truly explain it. It's a chat room, yet more. It's a way to share information about things that interest you. You can meet others that you may have things in common with. But these definitions somehow seem inadequate - lacking in some way. Today, perhaps one of the best things about Twitter was demonstrated through the community of those who tweet, in their unification by a fellow Tweeter's health crisis. Katie, a.k.a. @gardenpunk, is fighting for her life in a California hospital. What she first assumed was the flu turned out to be bacterial meningitis. Katie's situation is personal to me for a couple of reasons. It was in January 1999 that I fought and won my own battle back from the brink of death from this very same disease. I was not expected to live, yet I did, and I credit the thousands of prayers that were said, along with some very good doctors doing their thing. I tell you this to give hope that Katie can do it, too. Secondly, I have met Katie in person. She and her then husband, Chris, attended Spring Fling in Chicago last May. 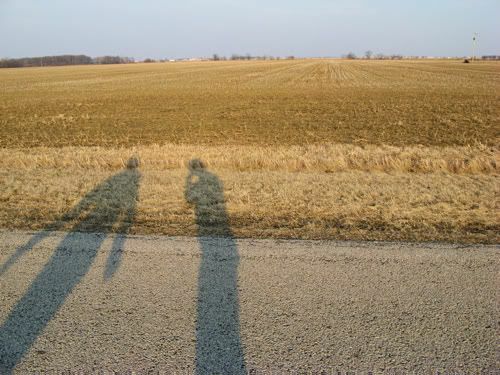 She always warned me that she was my official stalker, because she was one of the very first followers of Our Little Acre and became a very loyal one. After having met her and spending some time with her, I told her I was honored to have her "stalk" me. Sometimes you just click with people. Sometimes you just don't. There was no question with Katie. We clicked. It didn't matter that she was the same age as my older daughter; we were more like contemporaries. After Spring Fling, we began chatting on Twitter as I became more involved with it. 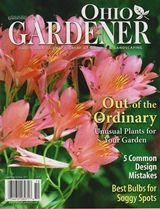 I'll admit that I wasn't all that impressed with it when I first signed up, but in time, as I used it more and more, I found some great gardeners and others with whom to connect. It soon became part of my daily routine. 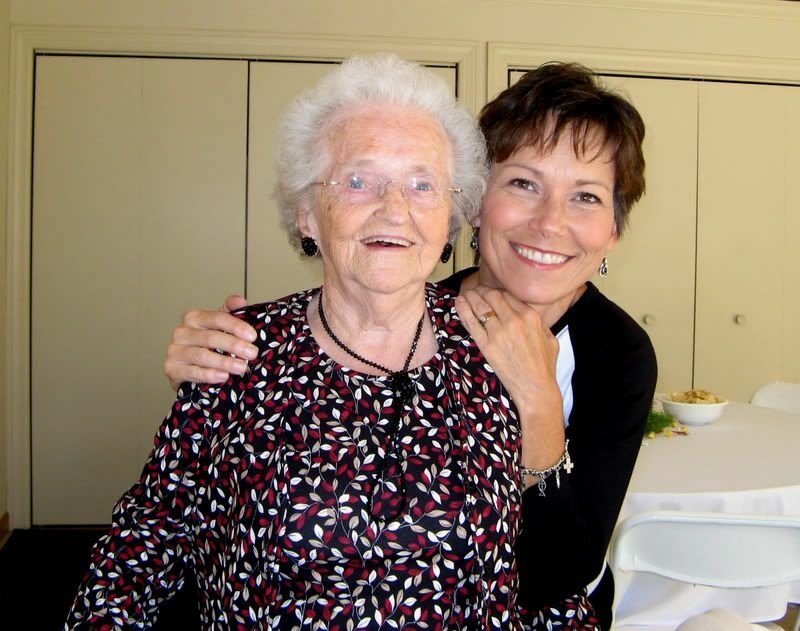 Earlier this week, Katie and I had a lengthy conversation (privately) about the turn her life had taken in recent months and she said she was as happy as she'd been in a long time. She had taken charge of her life and was living it the way she was meant to. I could feel her enthusiasm in the words she chose when she spoke. But just two days later, on Thursday, I got a late night tweet from Carri, who happens to live near Katie and is a good friend of hers. Katie had been taken to the ER and was in critical condition. It wasn't known at first what was making her so sick, but as Carri relayed available information to me, I told her it sounded eerily familiar to my experience with meningitis. In the end, Katie was diagnosed with just that and it had progressed to septicemia, which I'd also experienced with my own meningitis. Knowing how deadly the disease can be, I knew that Katie was going to need all the prayers she could get. Carri knew it too, and we talked about how we had each experienced the power of prayer in our own lives during our own past health crises. 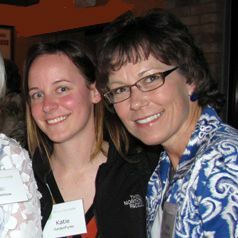 In the past months, Katie has become a vibrant voice on Twitter, both in the gardening community as well as to others. When word spread about her illness and fight for life, the Twitter community came together to pass on information about her condition and to express its concern for her. Good thoughts and prayers began to flow in amazing numbers. Tonight, Katie is still fighting and we're still praying. Though there's little any of us can do, through the power of the internet and Twitter, we can comfort each other and provide hope and encouragement to her family and friends. Her family is reading those messages to her and they're certain she can hear them. 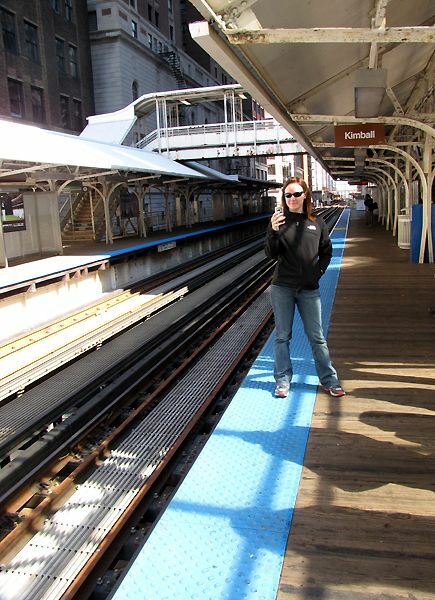 Most of us have never met Katie in person, but that doesn't make her any less of a concern for us, as we feel we know her through her online voice, thanks to her willingness to share her life with us on Twitter and on her blog, gardenpunk. Katie, we miss you and we love you. We'll continue to pray for you and think positive thoughts. We'll all be glad when you're back with us again. It's not the same without you. 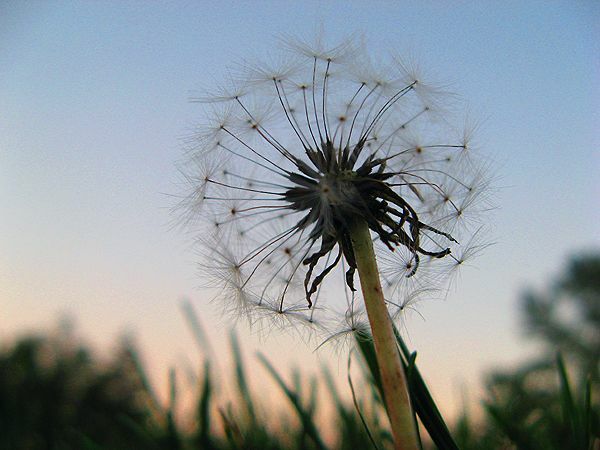 You can leave your own message for Katie and her family at her Caring Bridge page. This happens to me every year. The plant and seed catalogs come and I'm a goner. So many hours spent drooling over the possibilities contained within those catalogs - it reminds me of when the Christmas catalogs used to arrive in September when I was a kid. Sears, J.C. Penney, and Montgomery Ward would all send out their little books of temptations and I would retreat to my bedroom, paper and pencil in hand. There I would make my list of all the things I wanted for Christmas. I knew I wouldn't get them all - not even close - but it was still fun to make the list and dream. So it is with the garden catalogs. I open the pages and my brain goes into fantasy mode, although I don't recognize it as such. In my mind, I really can grow a Crape Myrtle in my garden. If I just site it correctly and mulch it a lot, it's possible, right? And I do have enough room to grow 138 different flowers by seed, don't I? 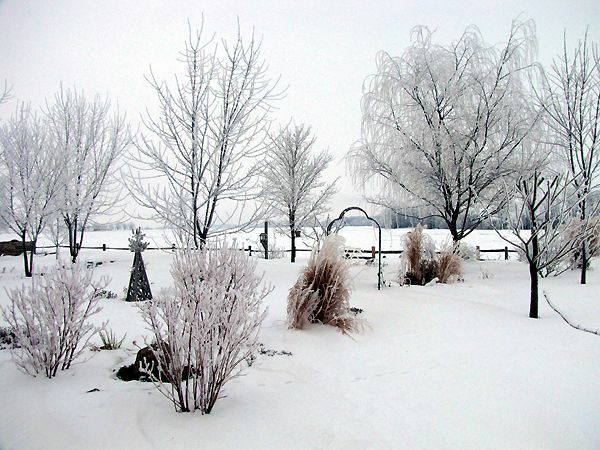 Fortunately, reality slaps me in the face and I remember my resolution to garden smarter. 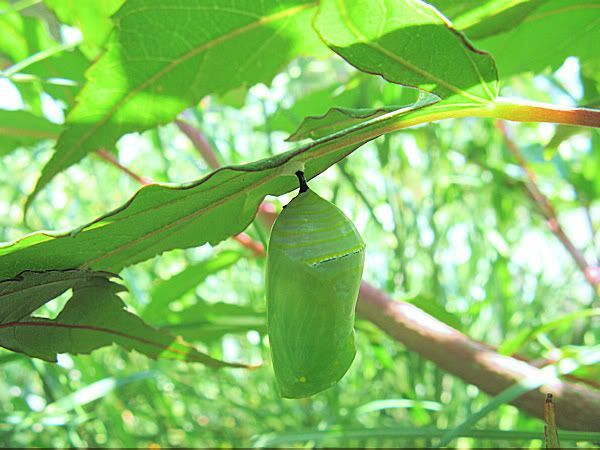 I tell myself that I can't grow everything anyway, so I might as well grow the things that I know will do reasonably well. No use shooting myself in the foot. That's not to say that on occasion, rising to the challenge of growing that beautiful but iffy plant shouldn't be done. 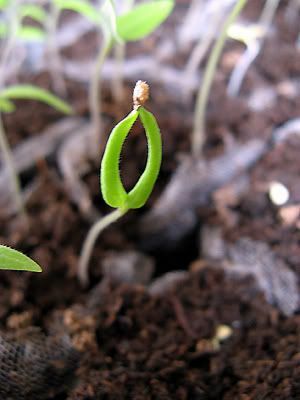 Success in those situations is all the sweeter and can be just one of the things that keeps gardening fun and interesting. 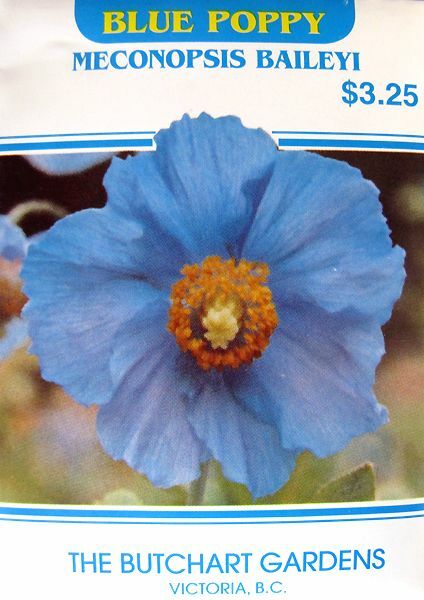 Take my attempts at growing the beautiful, but elusive, Himalayan Blue Poppy. I'll likely continue to pursue that until I'm successful at getting just one bloom or they have to pry the trowel from my cold, dead hands, whichever comes first. But no matter how beautiful and appealing some of the pretty pictures and plants are, I'll try to be strong and avoid putting the questionable ones in my virtual shopping cart. It's kind of like me wearing a bikini in my 50s. I've done it, but that doesn't mean I should. We still have quite a bit of snow on the ground at the moment. In some places it's still as high as three feet; in others, the ground is bare. The wind is responsible for the discrepancy. Around the tree trunks, it's as though there's a moat of bare ground as the snow swirled around them, but kept its distance when it finally landed. Last weekend, I was walking the drifts that were still firm enough to hold my weight, getting a bird's eye view of the gardens and assessing the state of things at this point in the winter. I was reminded that we'd lost one of our two apple trees last fall, and I'd been contemplating which kind we should get to replace it. I walked over to the remaining apple tree and immediately noticed a type of fungus growing on the north side of its trunk. 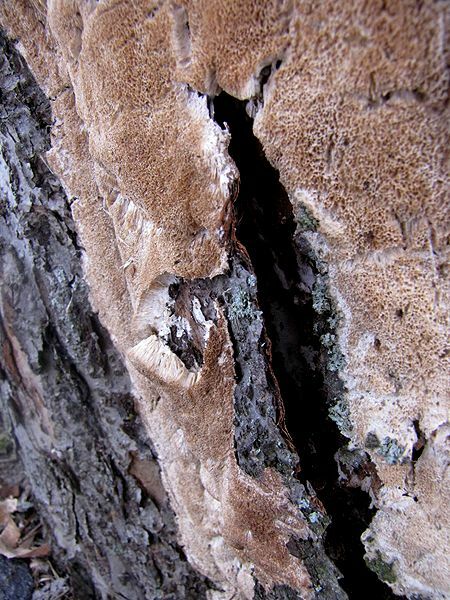 The outer layer of bark under the fungus had separated from the tree and I was immediately alarmed. I took a few photos of it so I could post them on Twitter and hopefully get some advice as to what was going on here. That's one of the beautiful things about Twitter. 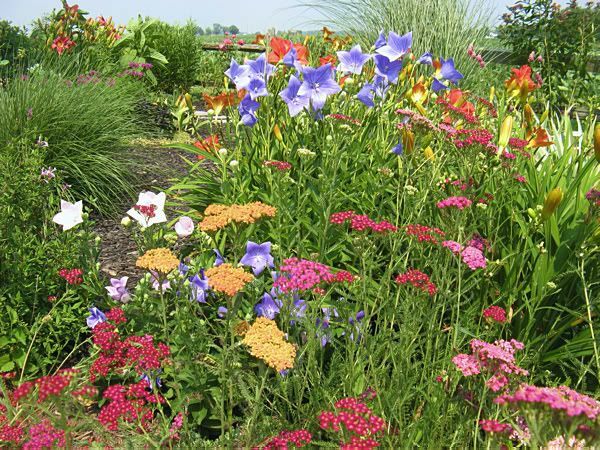 My group of "tweetmates" consists of mostly those as enamored with gardening as I am and they've taught me a lot in the months that I've been an active tweeter. They didn't let me down and within minutes of posting a photo of the fungus, I had two responses with the same answer. 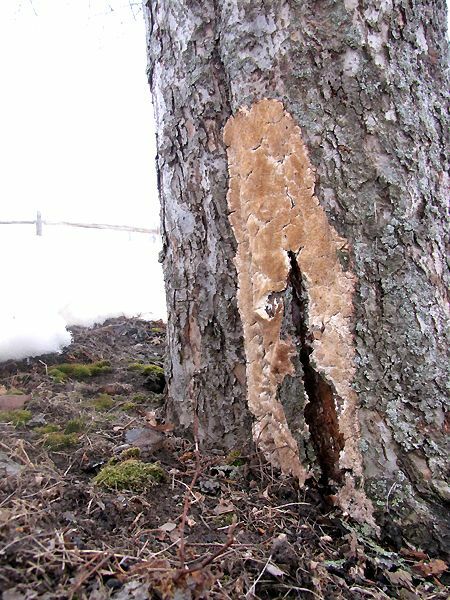 Our tree has a rot fungus. Which one doesn't really matter. 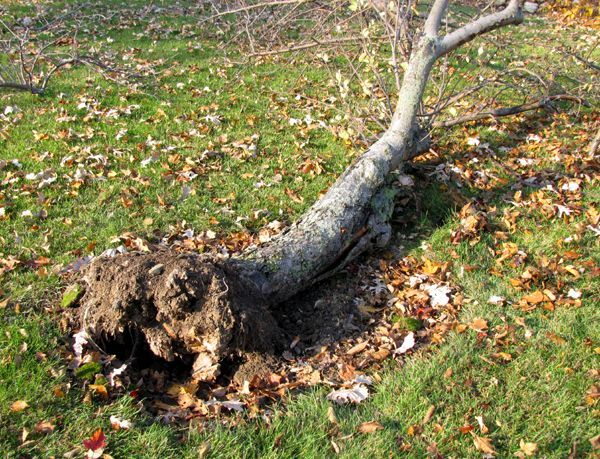 What does matter is that it usually is opportunistic, taking advantage of weakened or dying trees. I'm wondering if the same thing that caused the other apple tree to rot and die - seen in the photo at right - is now working on this one. It didn't produce many apples last fall, but I told myself that some years are like that. Both trees were gifts from my parents when we moved here in 1977, so we've gotten a lot of good 'Red Delicious' apples over the years. 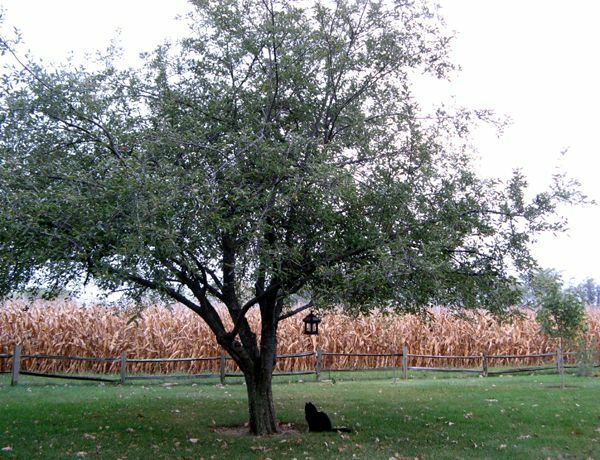 But it's not likely this 32-year-old tree is going to do well, so we've decided to take it down in the spring and just start over with all new apple trees. 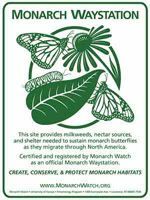 We've probably got room for at least three trees in that area, so we'll get a 'Honey Crisp' and two others that will be good pollinators for it. We like 'Gala' apples, too, so maybe that will be one of them. 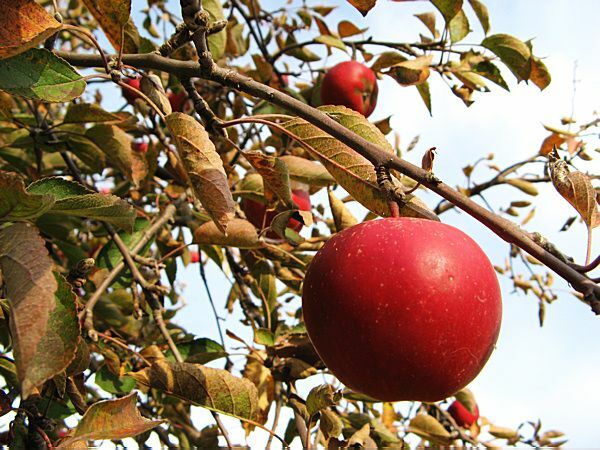 Hopefully, in a few years we'll once again have good apples to eat from our own trees. 2010 Central Ohio Home & Garden Show - A Giveaway! Having attended the Central Ohio Home & Garden Show in 2007, I know that we'll be in for a treat when Mom and I travel to Columbus to see this year's show. 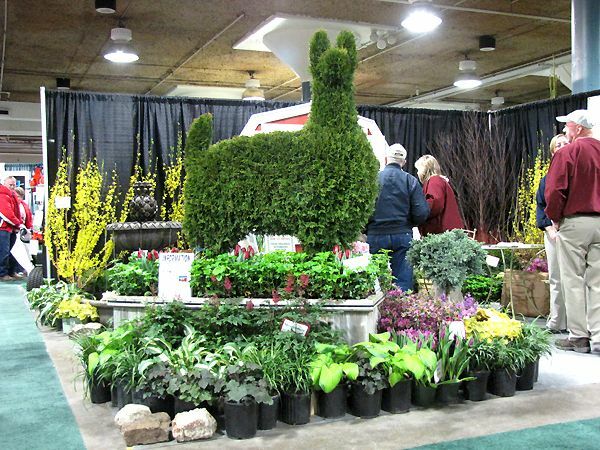 We will have attended the Ft. Wayne Home and Garden Show the day before, so we'll be pumped to see more spring ideas for our gardens and home. 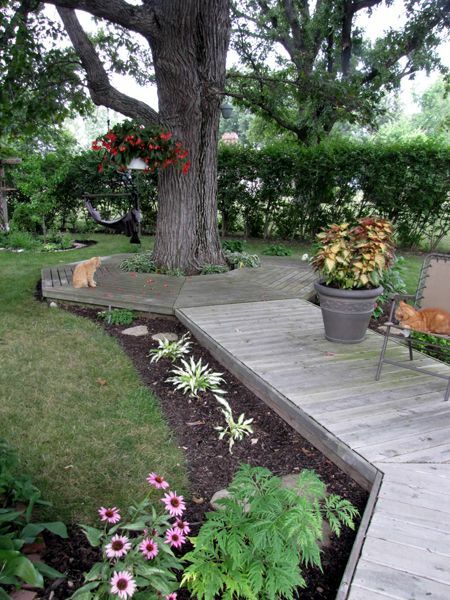 There will be 14 landscaped gardens designed by local companies with the theme "Art in Bloom." Over 400 exhibitors will be present for the show, in its 54th year. For more information about the show, including special appearance times, please visit their website. Saturdays: 10 a.m. - 9 p.m. 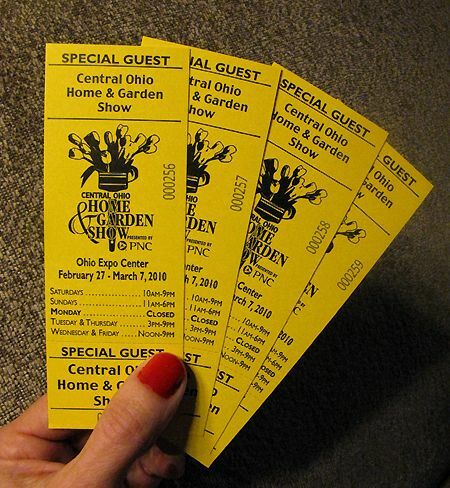 The Central Ohio Home and Garden Show has generously provided me with some tickets to give away to my readers! Simply leave a comment to this post by 10:00 p.m. EST tomorrow night (February 21, 2010), stating you'd like to win tickets and I'll randomly choose two winners. Each winner will get two tickets to the show, which I'll put in the mail on Monday. I'll post the winners' names here, as well as attempting to contact them via e-mail, so I can obtain a mailing address for the tickets. C'mon! You know you want to go! 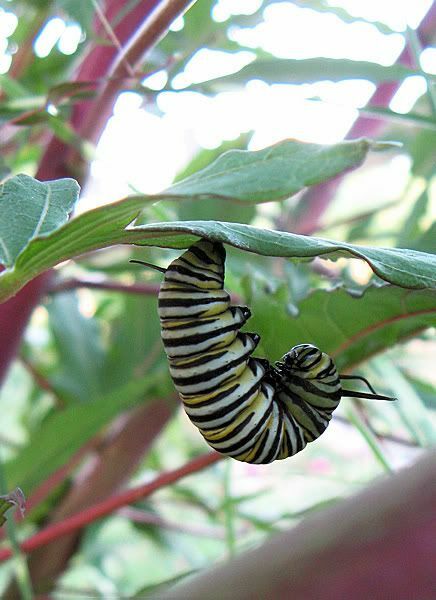 The writers over at Gardening Gone Wild have sponsored a photo contest each month for nearly a year now called Picture This and I've admired the wonderful entries from afar. This month, I decided to jump into things and enter a photo of my own. 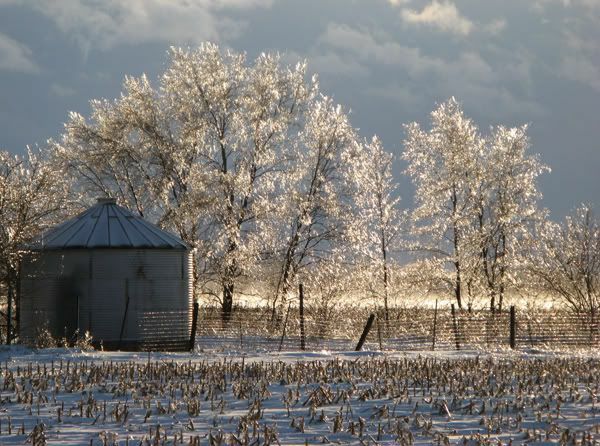 When I told Romie about the contest and its theme, "Winter Light," I asked him which of my photos he thought I should enter. The same one came to his mind that had come to mine. This is pretty remarkable, considering the sheer number of photographs I've taken over the last three years I've written this blog. Don't get me wrong. I'm not complaining. It's all good. Okay, all but the clutter, but I'm learning to live with it, because I can't do it all. Priorities have to be set and right now a clean house just isn't one of them. 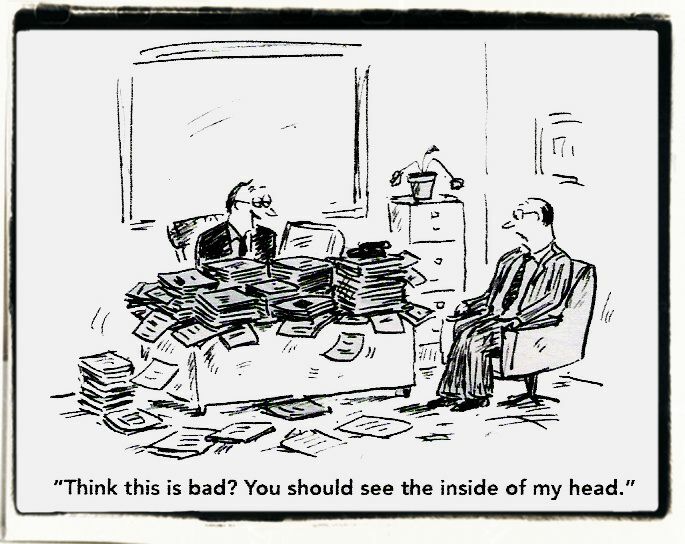 As long as it doesn't resemble what I've seen on Hoarders, I can deal with it. Man, I miss my house cleaners dish washers laundry doers kids. The 2010 Fort Wayne Home and Garden Show + FREE TICKETS! BREAKING NEWS! 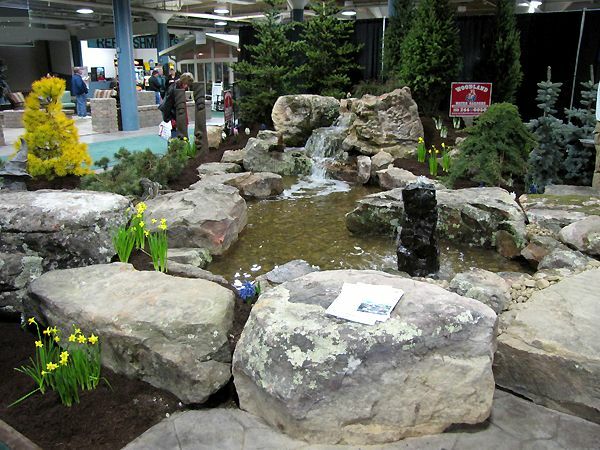 The Fort Wayne Home and Garden Show has graciously provided two free tickets to the show! If you'd like to be in the drawing for the tickets, just let me know in your comment to this post. I'll draw a winner on Sunday night at 10:00 p.m. EST. 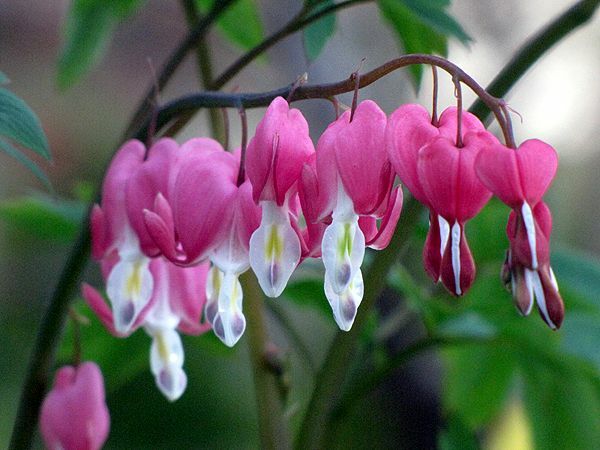 I know spring is on the way, because my garden show calendar is filling up. I love this. Seeing home and garden shows and flower shows taking up space on my schedule means another fun-filled and exciting garden year is about to begin! 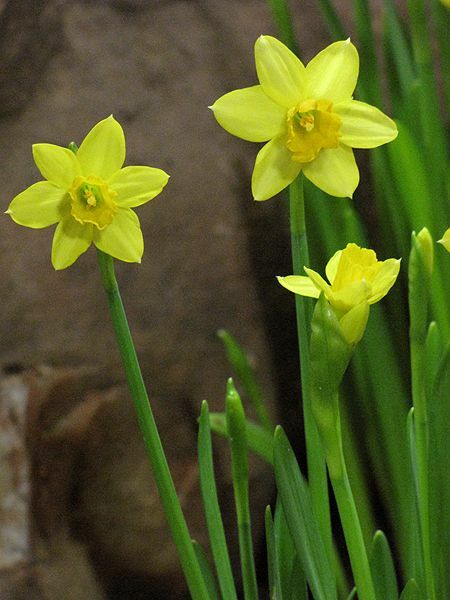 After a winter where all I could do was dream about tulips and daffodils, now I will see them in displays, knowing it's only a matter of weeks before they'll be pushing their way through the soil in my own gardens. Our local TV and radio stations are full of ads for the Fort Wayne Home and Garden Show, which begins next week (February 25-28). This show is always the first in our area and officially kicks off the gardening season for me. 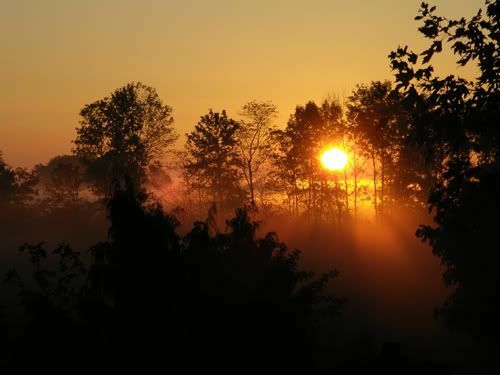 Others soon follow and before you know it, the red-winged blackbirds are singing and spring has arrived. At the door, where admission costs $10. A $3 discount coupon can be printed here. On Thursday and Friday only, you can get another $1 off the admission in addition to using the $3 coupon by bringing a canned food item for donation to the Community Harvest Food Bank. If you're a member of the American Horticultural Society, you'll enjoy free admission by showing your membership card at the door, due to their participation in the Reciprocal Admissions Program. 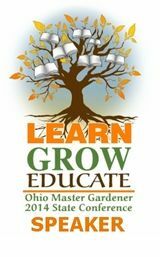 In the Garden Gallery, Aesthetic Plant Specialists and the Northern Indiana Flower Growers Association will be demonstrating how to grow and care for your vegetable gardens. 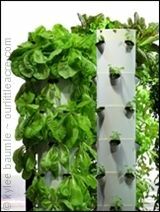 They will be giving away live vegetable plants to kids while supplies last, courtesy of Burpee Home Gardens. 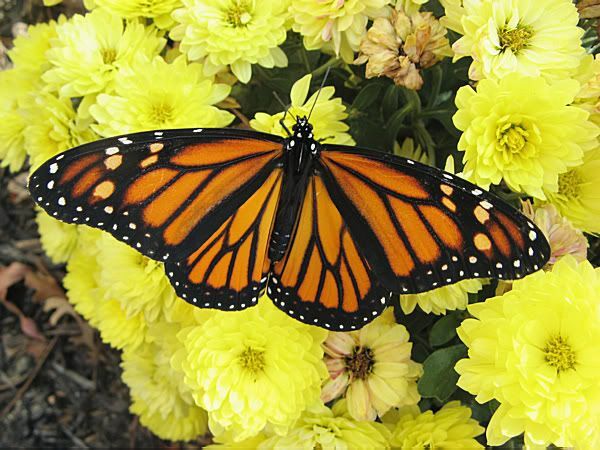 The Master Gardeners' Stage will be presenting seminars throughout the show. A schedule of their presentations can be found here. There will also be a $50,000 Untimate Home Makeover Giveaway on Sunday for those that sign up to win during the show. 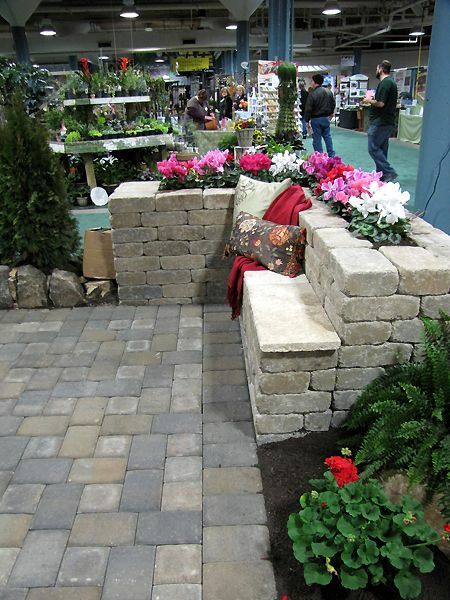 *Information and photos in this blog post are from the website of The Fort Wayne Home and Garden Show. I urge you to visit their site for the latest information or follow them on Facebook or Twitter. 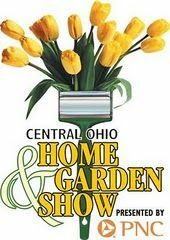 NEXT: The Central Ohio Home & Garden Show and ticket giveaway! The Great Backyard Bird Count 2010 is now one for the books and I'm happy to have been a part of it. While I always love watching the birds and their antics, focused attention on them always brings about new insights to their behavior. 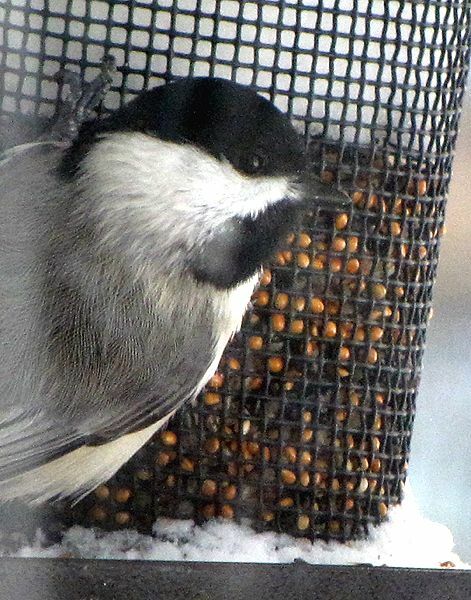 For example, I found that Black-capped Chickadees are flitty little things, difficult to photograph without blurring. They feed by grabbing a seed (sunflower seeds were a favorite) and taking it to a tree, where they peck at it to crack it open so they can eat the meaty insides. 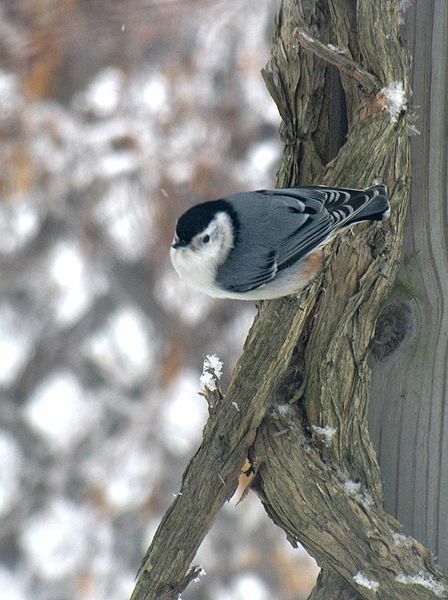 Again and again, they visited the feeder just long enough to get another seed, then quickly retreated to their branch. I wonder if they do this so they won't have to compete with other birds and can enjoy their meal in private. Cardinals and Blue Jays are usually common visitors to our yard, preferring the berries of the Washington Hawthorn trees here. But throughout three days of official counting, not a single Blue Jay and only two Cardinals were seen. There are still plenty of berries for them, so I'm not sure where they were. 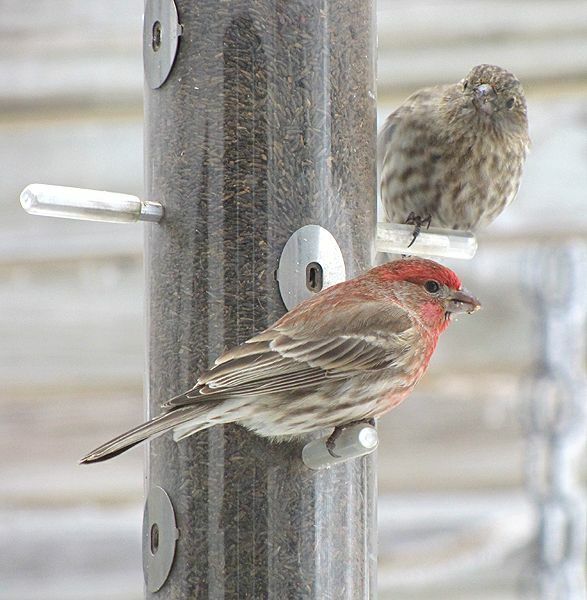 GBBC wants to know which species of bird you saw the most of at one time, and here, it was the House Finch. Once, I counted seven of their red heads chowing down, oblivious to the other birds around them and to me, watching at the window. The most fun to watch were the White-breasted Nuthatches, because they insisted on eating upside-down, even when they had a handy perch to rest upon. I think they're an especially beautiful bird and never tire of watching them or hearing their staccato calls. They alternated between the songbird mix and the sunflower seed, wanting little to do with the nyjer seed. 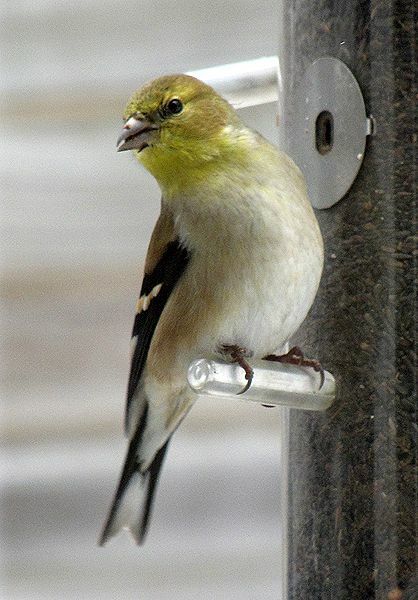 I had three feeders situated just outside the three side-by-side windows overlooking the patio. It's a fairly well protected area on the east side of the house, out of our most common west winds. The birds have learned that this is the place to come for a snack, so I had them filled to the top in preparation for the count. 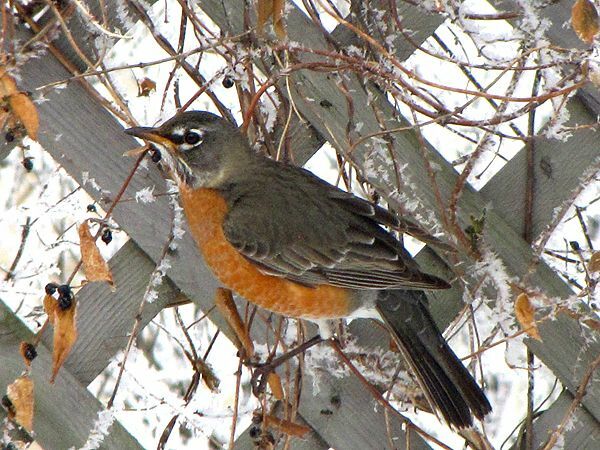 Contrary to popular belief, seeing a Robin isn't a reliable harbinger of spring. 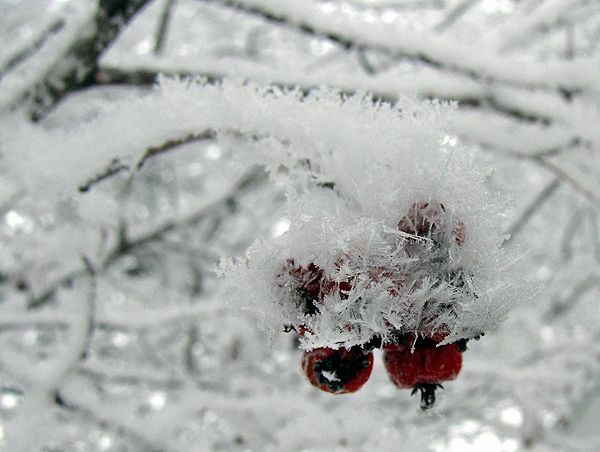 Many Robins will spend the winters in the north if they're able to reliably find food. We see them all winter here, undoubtedly because of the Hawthorn trees as well as the Honeysuckles and Crabapple trees. Now, when you start seeing the Red-winged Blackbirds in ditches and fields, then you can get excited about spring! Good quality feeders are a MUST. I like those that are easy to clean and those that are made with quality materials. I've bought some cheaper ones and end up having to replace them because they don't hold up to the weather. They either rust or fall apart. One that I like is the Droll Yankee Sunflower/Mixed Seed feeder that I offer in my OpenSky Shop. The top and bottom remove for easy filling and cleaning and the feeding ports are metal reinforced to protect them from enthusiastic feeders. It's got a Lifetime Warranty against squirrel damage, too! 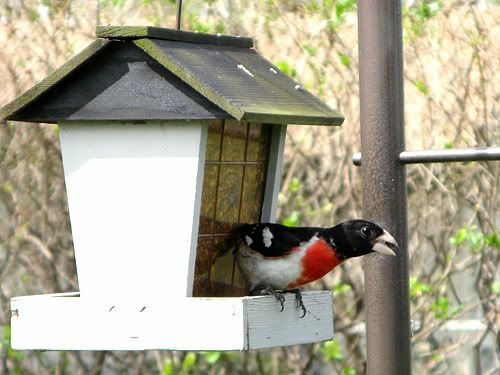 It really does pay to buy a higher quality feeder. The 15th of the month sneaked right up on me, which is rather unusual when it's the dead of winter. Winter isn't exactly my favorite time of year and usually drags by at the speed of glaciers. But this winter has zipped right by. The blooms here are pretty darn slim right now. Not a thing outside that I can see, and that is part of the problem. Everything is well covered by snow. It's going to take awhile before most things see the light of day. So the few blooms I have are all inside the house. 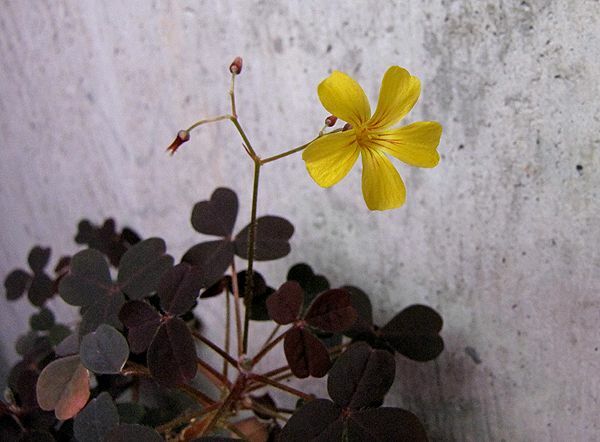 Usually, I store the Oxalis bulbs for the winter, but decided to just leave these in the pot. They've continued to grow and bloom under the lights in the basement. Now that the days are getting longer, maybe I'll bring them upstairs and put them in a south window. 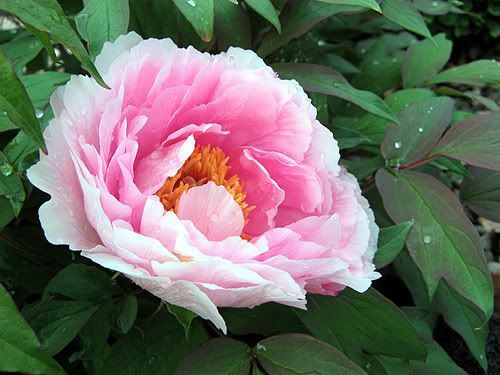 I love their contrasting foliage and the striations in the flower petals. 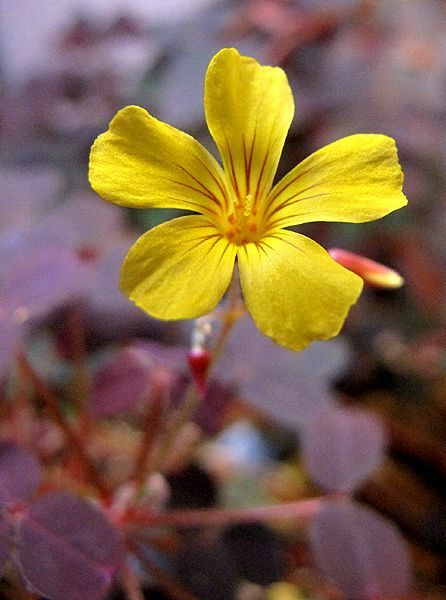 The blooms remind me of small hardy Geranium blooms - in yellow! 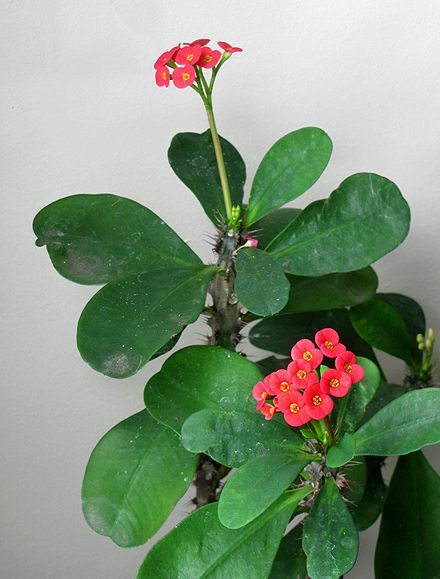 Crown-of-Thorns (Euphorbia milii) blooms all winter in a window with a southern exposure, though its blooms are sometimes much more pale than they are when it's outside in summer. I really should cut it back so it will branch more, but I'm afraid I'll kill it if I do. 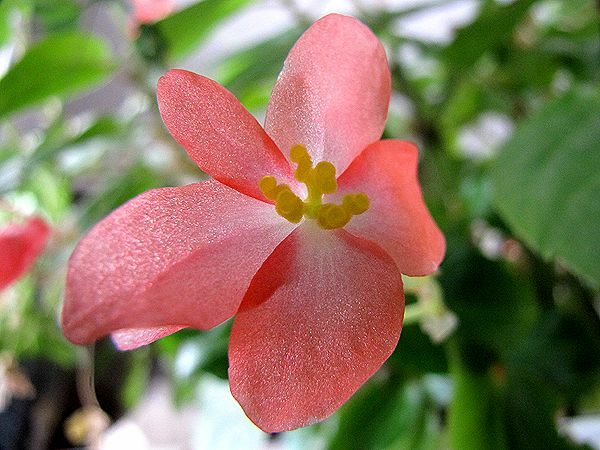 Finally - yes, only three blooms this month - the Dragon Wing Begonia hasn't stopped blooming since I brought it inside for the winter, not even after I cut it way back. 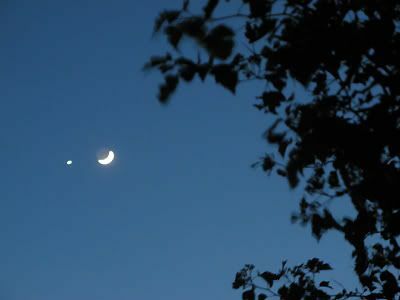 I can just imagine how wonderful it will be when I can return it to its spot, hanging in the big oak tree, this spring. 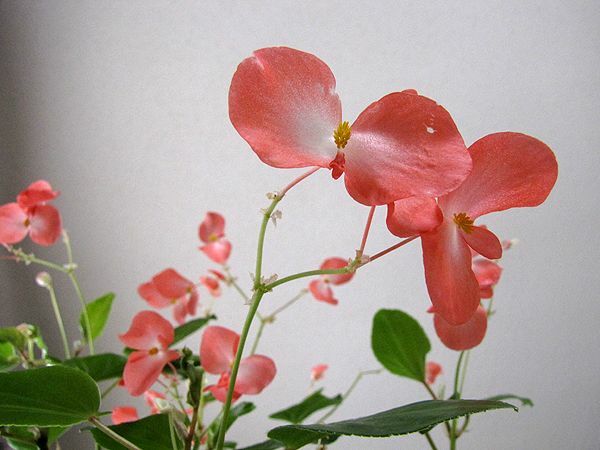 Its petals shimmer in the light, which shows how full of water they are. These kinds of plants don't react very well to overwatering, which is probably why mine has done so well. I keep forgetting to water it! I'm reminded whenever I start to see too many blooms laying on the floor. That's it. 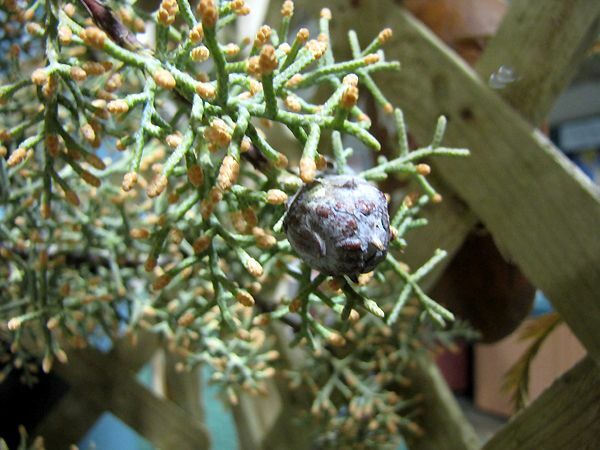 No orchids at present, though one is fat with buds. No amaryllis in bloom, but there will probably be one by next week. I'm looking forward to March's Bloom Day, when I hope to have some crocus and snowdrops in bloom outside! 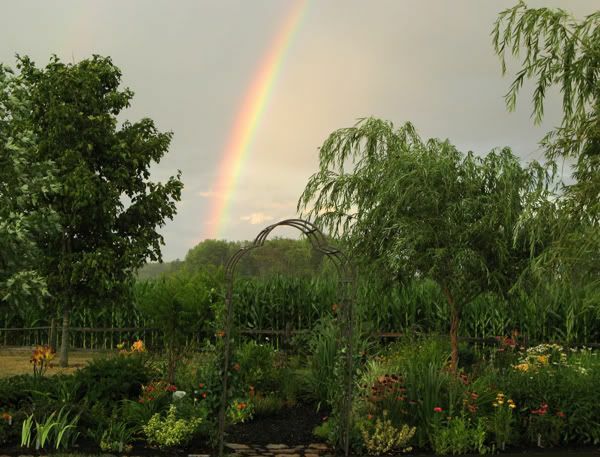 Be sure to visit May Dreams Gardens, where you can find links to other participating bloggers around the world, showing off their beautiful blooms, inside and out.